Imagine working for hundreds of hours over several years to realize a dream. Imagine needing just one more victory to achieve that goal. Now, imagine walking side-by-side with someone who has the same goal, but if he wins, you lose. That’s exactly what will happen on Saturday afternoon at the Nebraska State Wrestling Tournament during the “Parade of Champions,” one of the neatest annual traditions in Nebraska high school sports. In the final three hours of the three-day state wrestling tournament, 56 wrestlers will end their wrestling season with the referee raising their hand as a state champion. Another 56 will experience a level of dejection that they have probably never experienced and might not ever experience again. For two minutes though, they all experience the Parade of Champions. I first saw the Parade of Champions in 1989, as a college freshman, when I attended the tournament with a classmate who had won championships the previous two years. I last saw the Parade of Champions last year, 26 years later, as the parent of a wrestler who came up one match short of participating in the Parade. The format has changed slightly over the years, as well as the venue, but the intensity remains extremely high, even for a spectator in the stands. The wrestlers enter the 15,000-seat arena walking side-by-side with the opponents they will face in their championship matches. The public announce system will play Queen’s “We Are the Champions,” as they are led in a processional which will end with opponents facing each other on the very mat upon which they will decide the championship. The 15,000-plus fans will be on their feet cheering for wrestlers who typically wrestle in front of a few hundred – their successes often relegated to the box score section of the sports page. It’s an incredible affirmation of their journey. To get here, they each won three consecutive matches in a bracket containing the other 14 state-qualifying wrestlers in their weight class. Those guys are either in the stands, wishing they were on floor, or on the bus on their way home. For months, and most often years, the championship contenders have trained for this moment. They have endured some of the most intense practices a high school athlete can endure. They have made countless sacrifices to get here. Many haven’t tasted soda or fast food since November, as they transformed their bodies into lean wrestling machines. Most of them have missed the championship match in previous years, so they understand the significance of the moment. In fact, they have likely dreamt about this moment, as they left practice, sore, tired and worried about their next match. To convince themselves to persist in their journey, they have probably pictured where they will display their championship medal. Their coaches, teammates, friends and family will watch with bated breath, hoping their wrestlers will end the season with their hand held high. There will be celebrations for the winners and a long, restless night for the losers. The seniors know that this will be their last chance to make a dream come true. The underclassmen don’t know what the future holds, and as wrestlers, they know that they must seize their opportunity, because there is no entitlement in wrestling. The entire scene is a microcosm of life. Long after the wrestlers unlace their wrestling shoes for the last time, they will experience adulthood’s shocking successes and crushing disappointments. It’s unlikely that their subsequent victories and defeats will be broadcast statewide and happen in front of an arena of expectant eyes, but they will take the lessons they learned on this stage and benefit from them. Whether they land the big job or lose the major account, they will understand that both victory and defeat are temporary and that they must continue to apply themselves and the lessons they learned in order to reach their goals, like they did to be right here, in this moment. We all have had pinnacles in our lives – moments when our dreams were realized or crushed – so it should be easy for us to empathize with the drama from our seat in the arena or from our sofa at home. That’s what makes sports so compelling. You don’t have to be an athlete to recognize the emotion. This is real reality TV, and it’s available on public television at 3 pm this Saturday, if you can’t be at the CenturyLink Center in Omaha, you can see all of the final matches online at http://netnebraska.org/basic-page/sports/nsaa-high-school-championships. In the next few months, many children will have the opportunity to participate in wrestling for the first time. Just like the kids, many parents will embrace the opportunity, while others will resist. Because of the timely life lessons wrestling teaches children, I urge everyone to seriously consider trying the sport, if only for one season. Usually, those who resist wrestling are unfamiliar with the sport. Wrestling can be an intimidating sport, but it’s also one with great potential to develop young adults, both physically and mentally. My own son resisted until seventh grade. “I don’t want to roll around with a bunch of sweaty guys,” he told me, echoing the popular mantra of basketball players everywhere. My wife, with her medical background, wasn’t very supportive either, citing the skin rashes she saw wrestlers bring to her clinic. I had wrestled in high school – I wasn’t very good, but I wrestled – and I knew what it could teach kids, so I persisted until both agreed to a one-year trial season. That was four seasons ago – two in junior high, one on the junior varsity team and last year’s varsity season. In that time, he’s experienced extreme highs and extreme lows. There were times that he enjoyed wrestling almost as much as football, and there were times that he talked about quitting. There were dominating wins and puzzling losses, weeks when nothing could go wrong and weeks when everything went wrong. More important than all of that are the lessons that have helped him develop into the young man he is today. There is no entitlement in wrestling. It doesn’t matter where you are ranked or whether or not your coach likes you, your value as a wrestler depends on your most recent performance on the mat. Last year, I watched a wrestler, who spent most of the season ranked #2, lose two tough matches in the district tournament and fail to qualify for the state tournament. He was a senior who had placed at the state tournament the previous year, but that and his ranking didn’t matter – only what happened on the mat. In a matter of minutes, his season was over. In wrestling, you must constantly earn what you get. Wrestling teaches toughness. I got my first bloody nose in youth boxing at the age of 7, and never forgot it. At first, I wanted to cry and get out of the ring, but something deep inside me brought me back to the fight. Too many kids make it through childhood without a bloody nose. In wrestling, we have “blood time.” Wrestlers get their mouths smashed, their noses bloodied, their eyes blackened and their joints twisted. Wrestling teaches athletes how to work through pain and discomfort. Wrestling teaches toughness. Wrestling teaches discipline. Because they have to make weight and need to be in superb shape to succeed, successful wrestlers maintain their bodies like finely tuned machines. Even away from practice and competition, they can’t forget that they are wrestlers. When their friends are feasting on fast food and sodas or staying up too late, wrestlers have to make decisions that will help them on the mat. They know that slipping on discipline will have negative consequences on the mat. Wrestling instills confidence. It takes courage to walk out onto the mat. Once you overcome the fear of competition and the loneliness of being on the mat, everything else in life seems easier. Famous collegiate and Olympic wrestler Dan Gable says that 80% of wrestling matches are decided before the first whistle blows. “One competitor already knows he’s going to win, and the other knows he’s going to lose before either steps onto the mat,” he says. Once wrestlers develop confidence, they learn how to use it to give themselves a competitive edge. Wrestling teaches self-reliance. Too many kids look outward for blame when they experience failure. When you are on the mat, no one is going to come save you. You have to decide how hard you are going to fight to win. If you fail, you have no one else to blame. You can’t blame your teammates, your coach’s play-calling or officiating. You win or lose on your own. Wrestlers don’t go pro. Yes, I know that professional wrestling still exists, but very few wrestlers have professional aspirations. Contrast that with other popular sports. Many basketball, baseball and football players believe that they are going to make millions in professional sports, so much so that they plan for it at the expense of education and other preparation. Wrestlers are under no such illusions. They compete for the sake of competition, not fame or money. 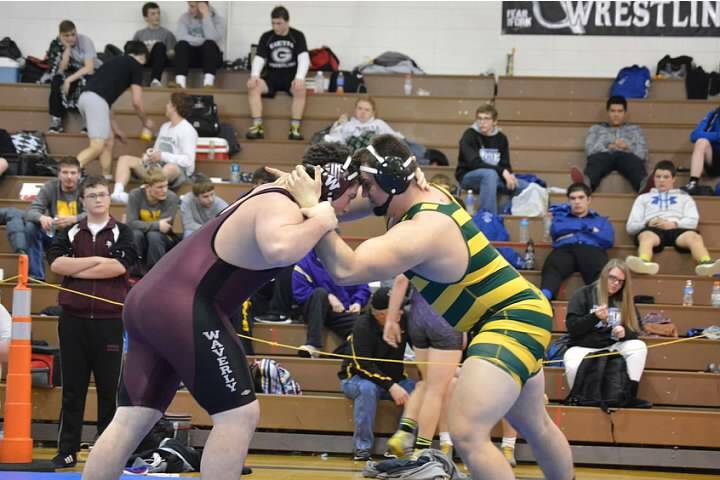 Wrestlers come in all shapes and sizes. Height and weight are large factors for success in several popular sports, like basketball and football, but they don’t mean much in wrestling. Wrestling is a sport where small kids or heavy, but relatively short kids can be extremely successful. 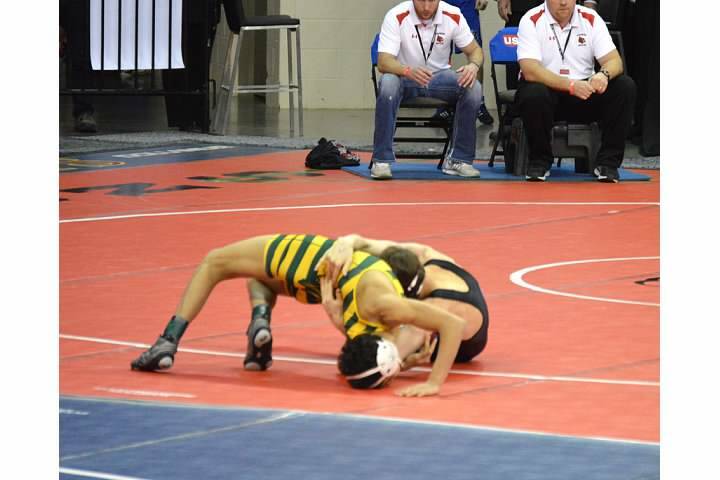 Where else can a scrawny 106-pound or short 250-pound kid win a state championship? Wrestlers learn to respect their opponents. There is a lot of down time at wrestling events, and many wrestlers will compete against each other multiples times in one season. In that down time, they get to know each other, and will even cheer each other on. Not all of them are friends, but they all know what goes into a wrestling season, and they respect each other because of that shared sacrifice. Even if your child never wins a match, he’ll learn a lot about himself and how he fits into the world. While it’s true the other sports can teach most of these lessons, the intensity of a wrestling season is hard to match. When you sign your child up for a wrestling season, you give them a competitive edge that will help them succeed in life. Don’t miss that opportunity. Tough people inspire me through moments of weakness. When I pull myself out of bed and grit my teeth in a struggle to stand straight, I think of the soldier guarding the Tomb of the Unknown Soldier, and my discomfort fades away. When I’m tired at the end of the workday, I think of my grandfather and his days working the sugar beet fields of Western Nebraska during the 1930s, and I’m reenergized. We need more tough people in the world today – people who persevere without pity. Tough people show us the potential of the human spirit. Tough people show us how to handle adversity. Tough people keep us from feeling sorry for ourselves. Wrestlers are tough people. Wrestling demands both physical and mental toughness. It’s difficult to understand the level of toughness involved in wrestling, if you’ve never wrestled. Most people see three two-minute rounds and mistakenly believe that their workouts of equal length are equivalent. Unless those workouts are against an adversary of comparable strength and size who is resisting your every move, they are wrong. I made that mistake myself as a high school sophomore. It probably wasn’t wise, and though he refused to do it for football, my doctor signed off on my sports physical for wrestling. I was grateful for the opportunity to compete and excited to cash in on the hundreds of hours I had spent in the weight room. Then, reality struck. Wrestling practices are brutal. We ran. We sometimes carried each other while we ran. We wrestled each other, and then we ran some more. Not only were we trying to increase our strength and stamina, we were also trying to eliminate any non-productive body weight. If we weighed more than we should, we would risk wrestling a better-conditioned opponent who weighed what he should. 160-pounders often played football at 180 pounds. You didn’t want to be at 160 pounds if you could be at 152 or 145. To avoid that, you had to be aware of your condition at all times, especially when your friends ordered pizza. Tough people are disciplined. They can deny themselves comfort and resist temptations. Wrestlers drag themselves to practice almost every day, knowing that they could be going home for a nap and lounge time instead, and many do it on an empty stomach. Wrestling practices are a brutal affair, as coaches push their athletes to do more with their bodies and minds than they think they can. Athletes who have participated in multiple sports will tell you that nothing compares wrestling practice. A fairly successful and now retired wrestler recently told me, “Everyone hates practice, but everyone loves winning. Wrestling teaches that practice enables winning.” That’s a pretty good lesson for a high school or college athlete to learn. It all culminates on the mat, in front of a crowd that is noticeably smaller than those who attend football and basketball games. Though the crowds are smaller, it’s hard to beat the passion of wrestling fans. Many of us have a history in the sport ourselves or we live with a wrestler and thus have a front-row seat to the struggles and sacrifices of a wrestling season. Our hearts are on the mats with the wrestlers we cheer for. On the mat, wrestlers strain to make their burning muscles do things that their opponent’s burning muscles won’t or to make themselves endure discomfort that their opponent won’t. A wrestling match is often as much a match of will as it is a match of skill and physicality. Those who have conditioned their minds to overcome obstacles and to push back fear give themselves an edge. That’s why wrestling defeats hurt so much. It’s tough to realize that you gave everything and still came up short – another good life lesson. Later this week, in Nebraska, the state’s best high school wrestlers will compete for state championships. 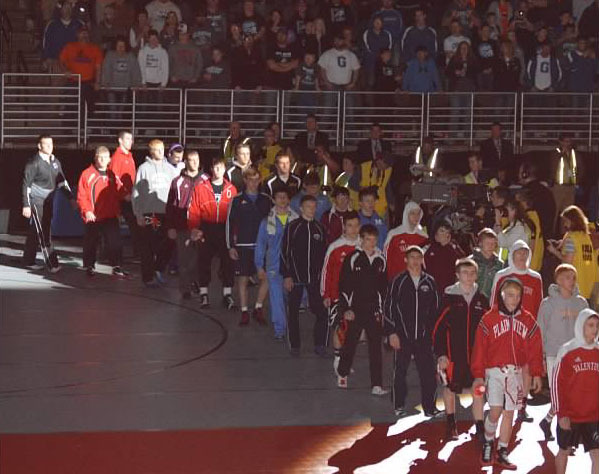 There will be 16 wrestlers in 14 weight classes for each of the state’s four school classes – 896 young athletes who enter the big stage with a big dream. By the end of the first day of competition, that dream will be over for all but 224 of them who qualify for the semi-finals on day 2. When whistles blow over the semi-finals, that number will be cut in half. In the finals on day 3, 56 will have their hand raised as champions of their weight class. Though only 56 will be crowned champions, they are all champions of toughness who made themselves elite through rugged exceptionalism. Though they might not walk off the mat with championship medals, they will have earned a toughness that should inspire us all. Would You Work with Freddy Krueger? Looking back at it, I’m fortunate that the receptionist paged her boss and not security or the police when I showed up in the lobby. I saw the fear and uncertainty in her eyes, and I couldn’t really blame her. I looked like I just tumbled out of a slasher movie. Two hours earlier, in my haste to get on the road, I tripped over a curb and landed on my left shoulder and cheek (the cheek on my face) in my office parking lot. The pavement was wet with melting snow, dirt and the snow-melt compound that the maintenance guy had put down. When I landed, I ground all of that into my face, hands, shirt and pants. For good measure, in stunned unawareness, I wiped my freshly bloodied knuckles on my pants. Seconds earlier, I had looked fairly good in my new black shirt and freshly pressed khaki pants. I was on my way to win business from people I had never met in person, and I was full of confidence. I didn’t look so good now, I thought to myself, as I looked in the rear-view mirror and wiped blood and dirt from my face with an old rag I found under the seat. I considered postponing, but it would have been weeks before I would be able to get all of these guys in one room again. My competitors would loom during those days. Because I had just enough time to make the drive, I wasn’t even able to stop by a bathroom to perform triage. I was going to have to go in raw and mangled, hoping to use confidence to overcome the obstacles my appearance presented. Many of life’s pivotal points come in moments like these, when our confidence is shaken at precisely the moment we need it the most. How we respond often determines our life direction, at least for a while. Doubt and feelings of inferiority often flash into our conscious when we have an unexpected opportunity to assert ourselves. Maybe a boss asks for our opinion in a meeting. Maybe we have an unexpected opportunity to volunteer for an important task or meet an important person. Rather than living with regrets, we should seize these unexpected opportunities for exactly what they are – opportunities. On my very first day of student teaching, in my very first hour, I learned that my cooperating teacher had called in sick and the substitute teacher had absolutely no idea how to teach the material. Instead of a day spent observing and getting comfortable with my surroundings, like I expected, I was thrust in front of a classroom of high school students for the first time since I was a high school student myself, three years earlier. I was nervous but it went well, and I developed courage under fire. I was fortunate that my life had prepared me for situations like this. For about 35 years now, I’ve dragged around a mostly non-functional leg, so I’m accustomed to people struggling to suppress inadvertent stares when I walk into a room of strangers. When I was younger, this bothered me tremendously, and I did everything I could to avoid walking in front of strangers. Even in college, I showed up early for classes and snuck away after the room cleared, in an attempt to make my first impression from a sitting position. I wanted people to know and like me, before letting them in on my handicap. I didn’t trust others not to judge me, and I hadn’t developed self-worth. Now, as a motivational speaker, I sometimes walk across an auditorium stage in front of hundreds. I’m able to do this, because I no longer worry about what conclusions people make when they see me for the first time. I know that the people who matter could care less about how I move from one point to another. In fact, I know that if I don’t let it bother me, they won’t let it bother them. Back in my truck after my client meeting, I looked at myself in the rearview mirror and smiled. My cheek was swollen now, and a rivulet of dried blood ran from the corner of my eye, but I killed it. My heightened confidence helped me compensate for my Freddy Kruger appearance. I had not only won the account, it’s been our biggest piece of business year to date. Cold weather has dominated the news recently, as frigid temperatures have gripped much of the nation. Locally, our newspaper ran a feature on Nebraska’s coldest December on record, the December of 1983. For several consecutive days thirty years ago, the temperature failed to break zero degrees, as the snow piled up. I remember it well, because I lived smack dab in the middle of the state in small town called Loup City, and I had a paper route. When the weather was nice, the 40-some stops on my paper route took about an hour, despite our inefficient delivery method. Instead of tossing a bagged newspaper from a car window into a driveway, we carried the newspaper to the door, usually carefully placing it between the screen and main doors. In this way, our customers were spared the discomfort of wandering out into the elements to retrieve their news. There was no discomfort spared on Loup City’s newspaper carriers in 1983. The deep snow kept us off our bicycles, and the barricade-like drifts made it nearly impossible to navigate the streets and sidewalks with our newspaper bags slung over our shoulders. I strapped my bag to a sled that I pulled behind me. Though the sled made my downhill trips much more enjoyable, it was drudgery, and what usually took about an hour now stretched to nearly two and a half hours. It was dark before I got home and started to thaw. SEALs are trained and constantly tested for toughness. The Navy selects only the most elite and dedicated sailors for SEAL training, and few of those have what it takes to pass the rigorous physical and mental training. SEAL trainees are subject to intense discomfort for several consecutive weeks, as their trainers keep them cold, wet and sleep-deprived throughout much of the training. To simulate the psychological challenges of combat, they constantly test the trainees’ mental toughness. After hours of grueling drills in the cold ocean, on very little sleep, the trainees are allowed a warm shower, but then trotted right back into the ocean and told to roll around in the sand. The training is so intense that it is monitored by physicians to ensure that the trainees’ bodies don’t shut down under the extreme temperatures and fatigue. Only the most physically fit can withstand such punishment. A bell is present throughout the most intense physical training, and trainees are reminded that a warm shower, food and sleep are immediately available to them if they want to ring the bell, signifying their decision to quit. Even after the careful selection process, 75-80% of SEAL trainees quit or fail each year. In Luttrell’s class, only 32 of the nearly 180 who started completed the full year of training. After fulfilling his dream of becoming a SEAL, Luttrell was sent into combat situations where the skills and expertise of a SEAL were needed. One such mission was Operation Red Wings, the mission upon which the book and movie were based. After an intense firefight with the Taliban, Luttrell was the lone survivor of his team of four. Badly wounded with a broken back and other injuries, and fading in and out of consciousness, Luttrell relied on the mental toughness he learned through SEAL training to survive for four more days, until special forces teams were able to recover him. During that time, because his body was so badly wounded, he had to be especially mentally strong to avoid capture by an enemy who was actively hunting him. Without extreme efforts to develop extreme toughness, he likely wouldn’t have survived, and this is precisely why SEALs are trained in the manner I described. Because he knew how to cope with almost incomprehensible adversity, Luttrell was able to maintain his composure and give himself a chance at survival. How mentally tough are you? Do you ring the bell and quit when things get tough? I believe that most of us aren’t very tough, and we know it. If you are among that group, don’t despair; toughness can be learned, and you don’t have to go through SEAL training to do it. Start by identifying situations in which you are tempted to quit. Your New Year’s resolution might be a place to look. Identify the discomfort that you are trying to avoid, and remind yourself why it is important to persevere in the face of that discomfort. Then, devise a strategy for overcoming the urge to quit when faced with discomfort. Once you train your brain to treat discomfort and adversity as temporary obstacles that must be overcome, instead of avoided, you’ll start to develop the mental toughness necessary to reach your goals.